Examples, solutions, videos, worksheets, stories and songs to help Grade 6 students learn how to find angles in quadrilaterals. We can use the information that the sum of interior angles for any triangle is 180° to explore the sum of the interior angles of any quadrilateral. We must first recognize that any given quadrilateral is composed of two triangles. Since the sum of the interior angles of a triangle is 180°, then the sum of the interior angles of the quadrilateral would be 360° (180° + 180° = 360°). We can also cut out quadrilaterals of various shapes and sizes. Use a protractor to draw arcs between the arms of each interior angle. Cut out each angle along the arc and arrange them so that their vertices are adjacent. We will see that the four angles of any triangle form a full circle (360°). 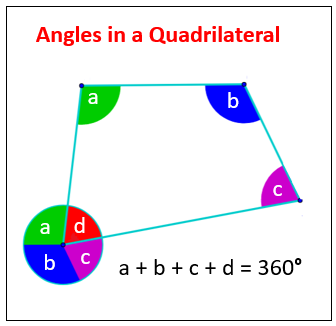 The sum of the angles of a quadrilateral equals 360 degrees. Cut out each vertex and arrange each side adjacent to one another. A 360 degree angle is formed. We can extend this concept to find unknown angles within quadrilaterals given the measure of any three angles. We can determine the unknown angle measure by subtracting the sum of the three known angles from 360°. Angles in a quadrilateral (that is a 4 sided shape) add up to 360 degrees. So if you are asked to work out a missing angle in a quadrilateral then add up the 3 angles that are given and subtract this answer from 360. So in the example given you have 3 angles inside a quadrilateral which are 120, 100 and 115 degrees and you need to calculate the size of the fourth angle x. 120 + 100 + 115 = 335.
x = 360 - 335 = 25 degrees.